Writing is my second career, but it was my first love. As a kid, all I wanted to be was a writer. I wrote "books" that my mother typed up when I was as young as five. In fourth grade, when we were expected to write three or four reports during the year, I wrote a hundred and one. Clearly I had the writing bug at a young age. Nevertheless, my academic career took a different direction. I loved mathematics too, and earned a doctorate from Princeton. I taught math for six years at Duke University and seven years at Kenyon College in Ohio. I enjoyed it, but I have to say I never felt that teaching was my true calling. When I was denied tenure at Kenyon (see the long story here), it was both a wake-up call and a chance to get things right. The most valuable advice I received was: "Think of what you wanted to do when you were a child, and try to make that happen." So when I found out about the Science Communication Program at the University of California at Santa Cruz, suddenly all the pieces of the puzzle clicked together. I could be a writer, as I had always wanted to be, and still make use of my knowledge of math and science. At UCSC I learned about journalism and made the contacts I needed to hit the ground running. An internship at American Scientist in the summer of 1997 gave me some practical experience in writing and editing with a deadline. Since the fall of 1997, I have been a full-time freelance writer. Some of the magazines I have written for are Discover, Smithsonian, Science, and New Scientist. For the spring of 2007 I am the writer in residence at the Mathematical Sciences Research Institute (MSRI) in Berkeley, California. The idea for my first book, The Big Splat, or How Our Moon Came to Be, came out of a meeting that I covered in 1998 for Science magazine. It was a conference about the origin of Earth and the Moon, and I was the only reporter there. In three days of talks, I was astounded to hear over and over about the giant impact theory of the Moon's origin — a theory that was completely unfamiliar to me, and yet was really the only one seriously discussed at this conference. I was amazed that the experts had more or less agreed on where the Moon came from, and yet no one outside the planetary science community knew about it! There was clearly a failure of communication between scientists and the public. It was up to me to bridge the gap. Writing the book was a lot of fun. It was the perfect size for a first book. It came out to be twelve chapters long, and I had about twelve months to write it. That meant that I had to tell one in-depth story a month, which was just the right pace for me. I enjoyed the feel of working on a long-term project, as a change of pace from jumping around from one article to another. A special treat, which I did not at all anticipate, was doing historical research with original documents. To research one chapter I traveled to Cambridge, England, to delve into the Charles Darwin papers. (What does Charles Darwin have to do with the Moon? Read my book to find out!) It's hard to express the thrill of holding in my hands a letter that Darwin sent to his son a century ago, realizing that I might be he first person to read it since then. The Big Splat came out in the spring of 2003, and received excellent reviews. Booklist, a magazine published by the American Library Association, named it as one of their Editor's Choices for 2003 — an honor accorded to only 63 books that year, and only four science books. Even with great reviews, a book like The Big Splat does not make its author wealthy. So it was a while before I could really contemplate writing another one. However, in 2005 two opportunities came along that I could not pass up. First, John Wiley & Sons, the publisher of The Big Splat, invited me to collaborate with two geologists, Brian Skinner and Barbara Murck, on a freshman-level textbook called Visualizing Geology. This is part of a new series of Wiley textbooks that are oriented towards visual learners. The collaboration went very well — Brian and Barb were very tolerant of the sometimes crazy suggestions of their neophyte colleague. In the end, I learned a lot of geology, and Wiley got a textbook that I hope is livelier than the usual classroom fare. After two books on other sciences, I was eager to write one about mathematics. Fortunately, the American Mathematical Society was looking for a writer to take over a series of slim books, called What's Happening in the Mathematical Sciences, oriented to a general audience. The first five volumes in this series had been written very ably by Barry Cipra (who likes to joke that I am "the other math writer"). But for one reason or another he was not able to complete volume six. I did some very light updating and editing of the six chapters he had written, and then added four new ones to round out the book. Both Visualizing Geology and What's Happening were published in early 2007. So now I am wondering where fate and the muses will take me next! As you might guess from the above photo, I am also a chess player. I have been a member of the U.S. Chess Federation since 1971 (the beginning of the "Fischer boom"). I was the state champion of North Carolina in 1985 and 1987, and earned the National Master title in 1988. 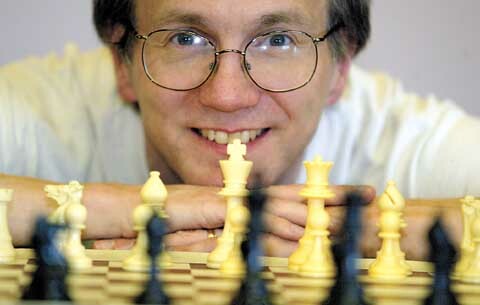 In 2006, I joined the team of master teachers at www.chesslecture.com. I record two video lectures a month. Ironically, I find teaching chess to be more satisfying than teaching math was. Perhaps it is because I know that my "students" at ChessLecture are already interested. My other hobbies include music and dancing. I started folk dancing in college, and years later I met my wonderful wife Kay that way. A couple of years ago I began to learn hula, which is the most difficult form of dance I have ever tried. The Hula School of Santa Cruz is a warm, supportive, and family-oriented group. I strongly encourage any of you who have ever experienced the aloha spirit — especially you kane (men) — to find your local halau and give it a try. It really is different from your preconceptions. Finally, no biography would be complete without mentioning my wife Kay and the rest of my family, three cats (Pixel, Chutney, and Maikai) and one dog, Willie the papillon. Kay supported me through my career change 100 percent. She is now working full-time at her own business. She is a quilting professional and has written and published six quilting books. If you have any interest in quilting, please check out her Web page at www.quiltpuppy.com. All text on this website is © Dana Mackenzie. Image copyrights may belong to other people or organizations. Contact me for further information. If you have any trouble spotting me, I'm the tall guy in the back row.